One of the main themes coming out of the keynotes and content at this year’s //Build 2014 conference was the continued convergence of the Windows Store and Windows Phone development platforms. One exciting result of the fact that both these platforms now target very similar Windows Runtimes (WinRT and WinPRT, respectively) is the support for the new “Universal Apps” in Visual Studio 2013 Update 2. (Another exciting result is that the “Programming the Windows Runtime by Example” book that Jeremy Likness and I wrote is even MORE relevant!) Projects created using the Universal App templates in Visual Studio include primary projects for each targeted platform as well as a shared project whose content “magically” gets included into each of the head projects. Currently, only Windows 8.1 and Windows Phone 8.1 primary projects are supported, though apps targeting the Xbox One will one day be included, and Xamarin has indicated they’d be joining the fun soon. I want to focus on the mechanisms working behind-the-scenes that enables these things to work. How does the Shared content make its way into the app projects in the solution, and why does it behave differently from other sharing mechanisms? I find that understanding the inner workings of things leads to better decision making when employing them…perhaps that’s why I enjoy reading Jeff Richter’s books. Where did they put the hood latch on this model? Regardless of what editor you choose to use, the content of your project files will follow the MSBuild Project File XML schema that is described here. One of the jobs of the Visual Studio IDE is to properly maintain the various MSBuild schema elements as you add, remove, or rearrange items within your projects, but nothing prevents you from doing that manually, and there are actually a few MSBuild “tricks” that you can take advantage of that aren’t provided by the Visual Studio IDE. Keith Rome has a blog post covering Wildcard Inclusions in C# Project Files that takes specific advantage of this capability. 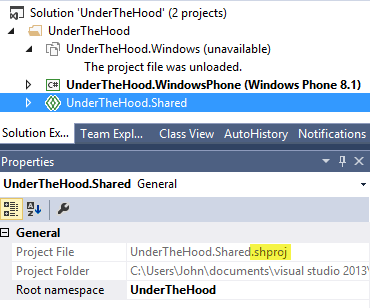 The Shared project extension is actually NOT what is referenced in the project files’ Import Element! NOTE: You may also want to notice that there’s a Root Namespace property. Setting this value determines the namespace that is given by default to new code files created within this shared project. 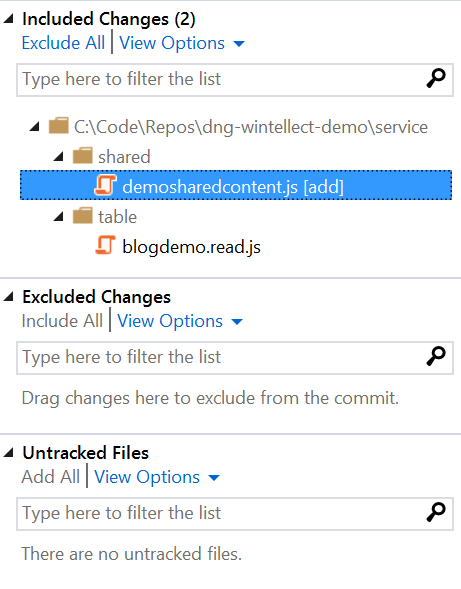 So as you add, remove, or manipulate items in the shared project, the contents of the projitems file is updated, and this file’s contents in turn are simply incorporated into your app project files via the Import elements in their MSBuild XML. This is why you can use #if declarations that are scoped to one project or another to differentiate behavior. But wait, there’s (partially) more! Partial methods are inherently private in scope. They can be static, and can be generic. Delegates can only refer to implementations of static methods. 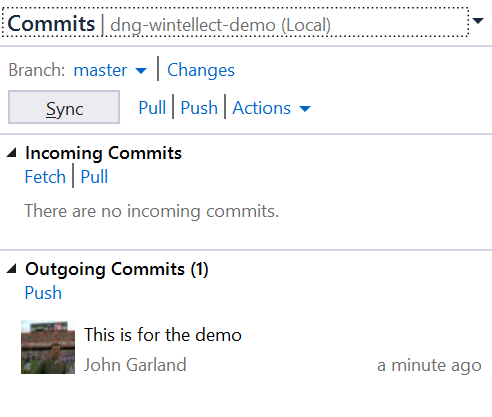 So hopefully now you have a better understanding of how these magical new shared projects work in Visual Studio. Much of the technology they use has been in the DNA of our project files for a while. Visual Studio 2013 Update 2 has been enhanced to include some nice new IDE updates in order to surface these features in a way that makes them very useful for writing reusable code. This new compile-time reusability combines quite nicely with the post-compile reusability that is offered by Portable Class Libraries. If you want to learn more about them, Jeff Prosise will be delivering a session on universal apps at the Software Design & Development conference in London next month. The talk will delve into what universal apps are and how they’re structured, and he promises to have plenty of samples to share as he goes over the ins and outs of writing apps that target separate but similar run-times. You might also benefit from watching Jeff’s video entitled Introduction to WinRT on WintellectNOW. If you’re not already a subscriber, you can sign up with the promo code Garland-13 and enjoy two weeks of access for free. Also, did I happen to already mention that Jeremy Likness and I had written a book about using the Windows Runtime? Now that the stage is set, I’d like to offer some tips for how to extract a little bit more from these IntelliSense files. One of the problems with the IntelliSense solution is that there’s no information providing Visual Studio with insight as to how to handle the parameters in the script signatures. The good news is that is not hard to do, and since these objects are frequently referenced within the WAMS scripts, being able to allow them to join in the “IntelliSense party” provides a lot of help. Custom API scripts receive two parameters – request and response. However, it is important to note that the request object used in Custom API scripts is not the same request object that is used in the table scripts…in fact, this object provides access to several objects that are directly used as parameters in the Table operation scripts. This distinction is covered in the MSDN documentation for the request object. 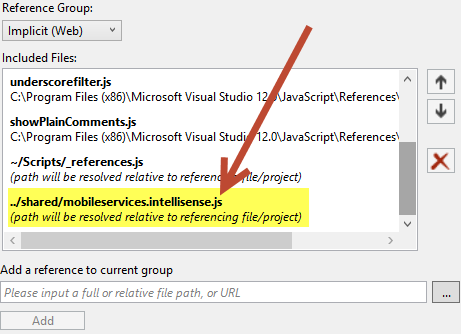 Because I now maintain and reference a copy of the mobileservices.intellisense.js file within my source-control-managed “shared” folder, I can augment and/or make changes to the file with some confidence…when an update to the IntelliSense file is published, I can simply drop the file into place, and before committing and synchronizing the changes I can use a differencing tool to see what has changed. Ideally, I will notice if the new file is about to lay-waste to the changes I’ve put in…so let’s change the definition file. I’ve basically added some content to the definition file to provide information about the request object for Custom APIs. The IntelliSense content I’ have added comes from a combination of the MSDN documentation and the Express.js library documentation, which is where these request and response objects originated. My content is not comprehensive – I’ve only documented the items that were immediately relevant to me, but there’s nothing to stop others from adding more content – the Express.js documentation for the request object can be found here and the documentation for the response object can be found here. I have it on good authority that the Mobile Services team is continuing to work on ways to enhance the script editing experience, so it is likely that some of these steps will only be temporary. But in the interim, the inclusion of these IntelliSense aids should make editing WAMS script files in Visual Studio considerably simpler. 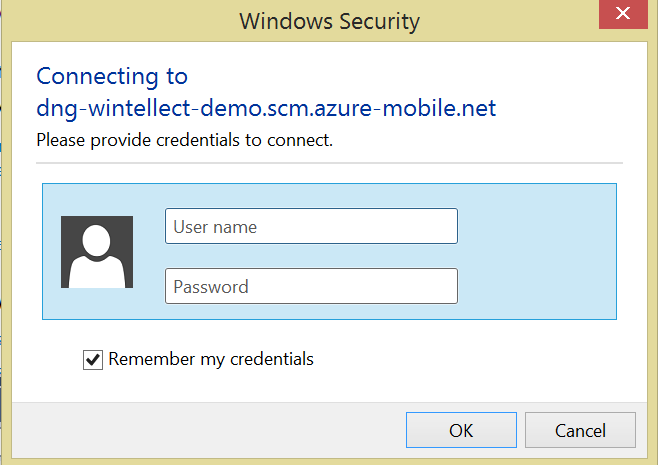 Windows Azure Mobile Services (WAMS) has come a long way in a few short months. At the 2013 Build conference in San Francisco, Microsoft announced more than the service’s General Availability date – it also showed that the service had been integrated into the Visual Studio 2013 Preview in several key places. These included a “Connected Services Manager” that will augment an existing project to connect with a new or preexisting WAMS instance, an entry for WAMS in the Server Explorer panel that allows viewing and editing the server-side data table business logic scripts (with access to the other WAMS script elements expected to be added over time), and a Push Notification Wizard that facilitates connecting an existing Windows Store app to a WAMS instance. 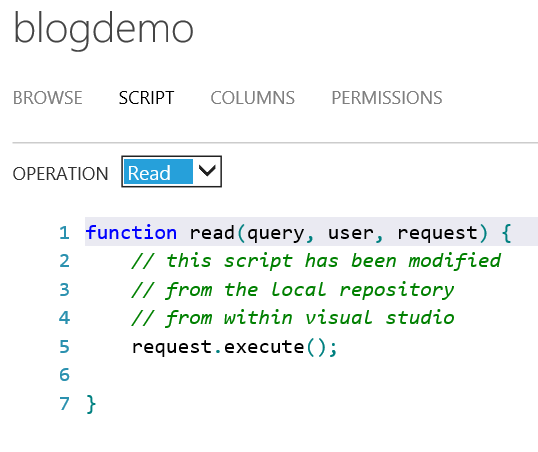 These features are detailed in this post on the Visual Studio Blog. The expectation is that these integration points are expected to be enhanced as Visual Studio 2013 is updated to its RTM version. 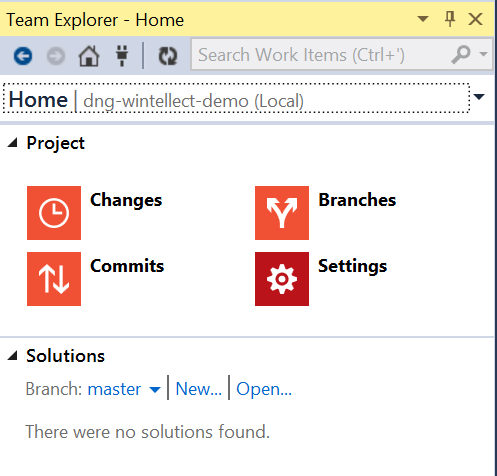 To mostly round out the collection of the tools will be discussed here, the Team Foundation Server Power Tools team at Microsoft has released the Visual Studio Tools for Git, which is an extension that allows Visual Studio’s Team Explorer to integrate with Git. 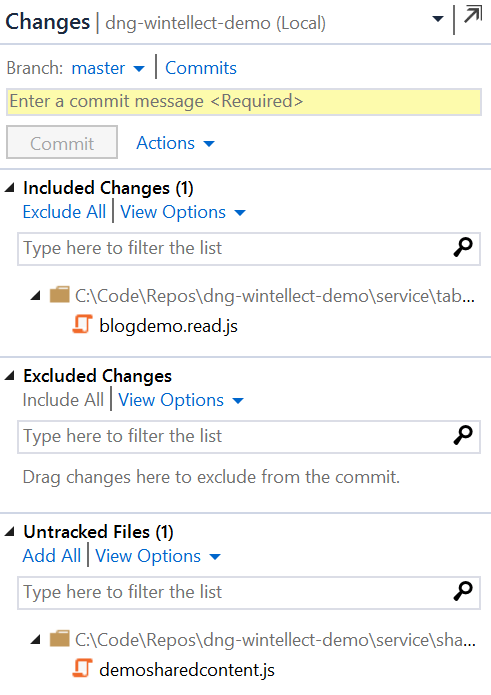 This integration includes using the Team Explorer GUI to manage and connect to local repositories, as well as to track changed elements in a selected repo, and managing branches, commits, and syncs in that repo. As of this writing, the extension is at version 0.9.5. 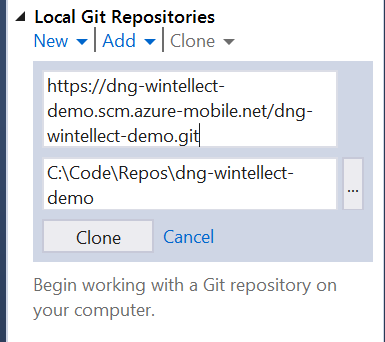 This post will explore how the new integrated Visual Studio tools for Git can be used to provide GUI-based source-controlled management for client-side editing of the scripts belonging to a Windows Azure Mobile Services instance. – Provide a username and password to be used for access to mobile service Git repositories within the subscription. These credentials can be changed later by selecting the “Reset your source control credentials” link on a WAMS Dashboard page for any Mobile Service attached to the same subscription. 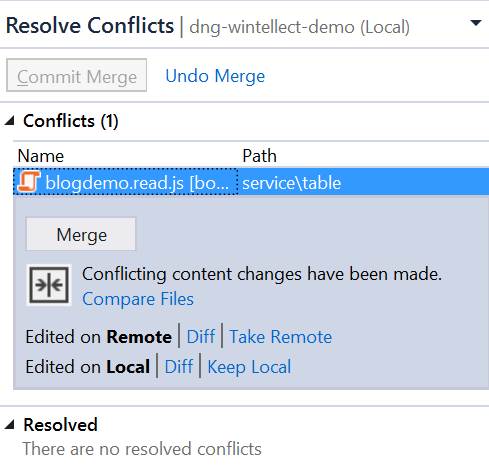 – Copy the Git URL from the service instance’s Configure tab. In the ensuing Connect dialog, select Clone to do the initial setup of the local repo as a clone of the server repository. This will show a couple of text boxes – the top one is used to provide the URL to the remote repository – paste the URL that was copied earlier from the WAMS Management Portal. In the second one, type in or browse to the local directory path into which the repository should be cloned. When you press the Clone button, you will be prompted for your server-side Git repository credentials. …and after entering these credentials, you will have a local clone of the WAMS repository. 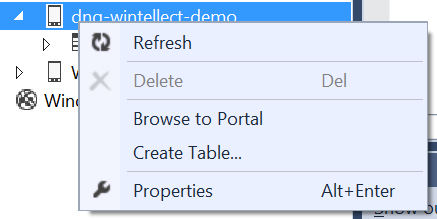 If you right-click on the new repository entry in the Team Explorer Connection Panel, you will see context menu options which include one for opening the repository in File Explorer. shared: contains scripts and/or Node.js modules that can be reused by other scripts in the service instance. Note that there is no browser in the portal (at present) for files in this folder. Note #1: Each folder also includes a text md file that describes the intended contents of the folder and any layout constraints for each file. Note #2: For the most part, with the exception of the “shared” folder, the files should be “seeded” by creating the desired named item server-side and then syncing the repository. WAMS often has to spin up other infrastructure elements in addition to just the scripts, such as database tables and entries for the scheduler. For Table scripts, the table can be created in the Visual Studio Server Explorer, but the individual table operation script files won’t be brought down by a Sync operation until the corresponding scripts is modified in some way – the change can be as simple as adding a comment. Once the file has been altered and saved to the server, using Sync will fetch the file to the local repository. The WAMS instance context menu (with the Create Table option) in the Server Explorer is shown below, along with a script that has been modified with nothing but a comment. The screenshot below shows after the file above has been saved to the server from within the Server explorer, after doing a Sync of the Git repositories, the local folder has been updated with the table’s corresponding read script file. Note that generating files this way is probably best left only for initially “seeding” the files, thus leaving day-to-day editing to an operation that is covered by source control and includes change tracking, etc. From the Connections panel, opening one of the repositories (double-click or right-click and select Open) displays the Home panel for the selected repository. Once the collection of changed files that is to be committed to the local repository is ready, a commit message (comment) can be entered and the Commit button can be pressed. Pressing the Commits link from this panel, returning to the home panel and selecting the Commits button, or selecting the Commits pulldown at the top of the TFS explorer will show the current set of outgoing and incoming Commits available for Syncing with the Server. 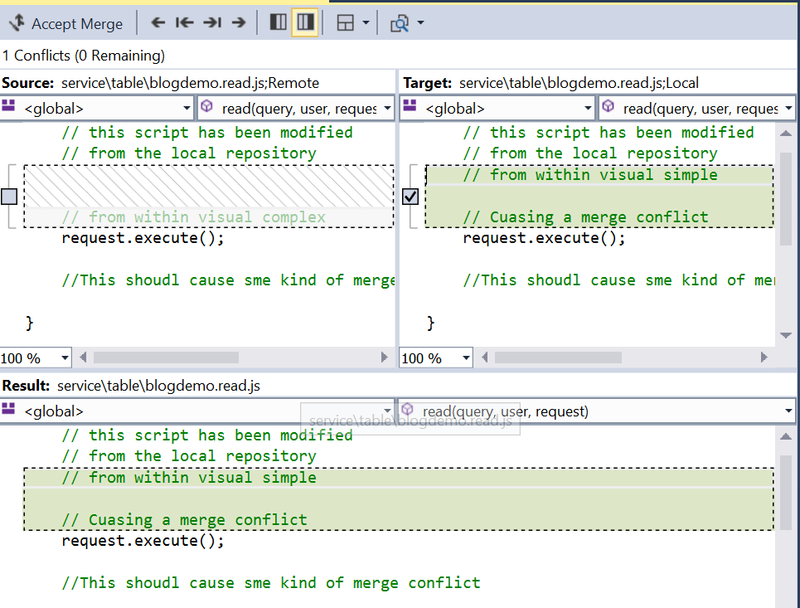 Once the Merge is committed, it can be synced to the server. 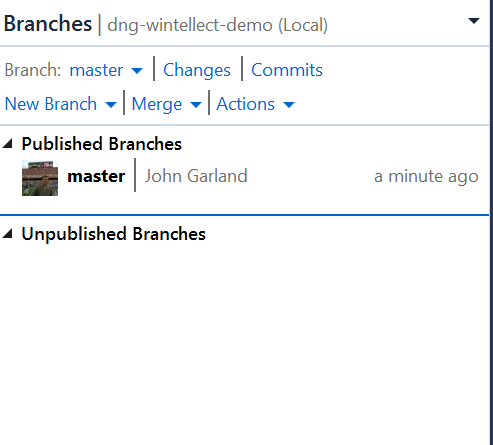 The final working panel that hasn’t been shown yet is the Branches panel, which allows management of branches in the selected local repository. While Windows Azure Mobile Services currently benefits from several points of integration into the Visual Studio 2013 IDE, the addition of the Visual Studio Tools for Git offers an additional tool to help with the management of server-side scripts. For what it’s worth, the Visual Studio Tools for Git also works with Visual Studio 2012, and supports the same kinds of source control management as was shown here in Visual Studio 2013 Preview, except that Visual Studio 2012 lacks the additional WAMS integration points such as the entry in the Server Explorer. Nonetheless, look for the integration of these tools to become even richer as WAMS, Visual Studio 2013 , and even the Visual Studio Tools for Git are enhanced over the next few months. Many thanks to the participants, organizers, and sponsors of today’s LIDNUG webinar – “Putting the Cloud in Your Pocket Pt1 – Using Windows Azure to Build Cloud-Enabled WP7 Apps.” I especially appreciate the patience of those who attended as we struggled to do the best we could to resolve the LiveMeeting technical issues that dogged us during the presentation. For what it is worth, prior to the presentation, the LIDNUG folks made sure we did a technical walkthrough to do everything possible to mitigate the possibility of running into these kinds of glitches…alas, despite our best efforts, the “demo gods” decided to frown upon us today. As I mentioned during the talk, I have gone ahead and posted the code (along with the slide that were available for download during the talk) here. As is often the case with talks about this topic, the demo contains keys and other “private” information that is specific to my own Azure account. With that in mind, I have sanitized/removed the private content from the posted demo code, and included a document “ACS Update Instructions” alongside the code zip file that describes the steps necessary to get yourself up and running with your own Azure subscription. As we mentioned during the talk, I will be working with the LIDNUG folks to make sure we are able to post a complete recording of the presentation. Stay tuned for updates. In the meantime, please be sure to check out additional upcoming Wintellect events as well as upcoming LIDNUG events, and please be sure to visit our webinar’s sponsor – Syncfusion. I had a tremendous time this weekend presenting alongside Bill Wilder, Michael Collier, John Zablocki, and Jim O’Neil at the Boston Azure Bootcamp event in Cambridge, MA. The topic once again covered the concepts of using Windows Azure to enhance mobile Windows Phone application and general mobile development considerations, and went beyond my demos to include a hands on lab that most everyone seems to have enjoyed. As promised, the slide and code content I referred to in my talk can be found here. I mentioned to a few who asked – there are some values in the lab that are specific to the ACS namespaces I have set up. I am including in the code file a word doc that indicates how to set up the ACS values for the demo code in question. Again, many thanks! I’m looking forward to hearing about how folks are using Azure to add cloud “goodness” to their mobile applications.